The following diagram shows how to convert between Molarity, Moles and Volume. Scroll down the page for more examples and solutions. 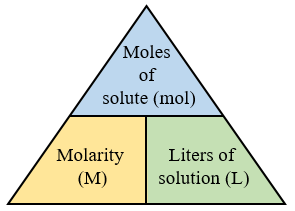 Practice problems with molarity, calculate the moles and liters to find the molar concentration. How to use conversion factors to convert between grams and moles, and between milliliters and liters. 1. Calculate the molarity of a solution prepared by dissolving 9.8 moles of solid NaOH in enough water to make 3.62 L of solution. 2. You dissolve 152.5g of CuCl2 in water to make a solution with a final volume of 2.25L. What is its molarity? 3. A solution has a volume of 375 mL and contains 42.5 g of NaCl. What is its molarity? How to solve Molarity Problems? 1. How many moles of NaCl are in 3.5L of a 1.5M solution of NaCl? 2. If you have 4.1 moles of glucose and want to have a 0.25 M solution with it, what will be the final volume of the solution? 3. If a student has 35.0 g of FeCl3 and needs to make a 1.5 molar solution with it, what will the volume of the solution be? 4. How many grams of NaOH do you have to dissolve to make 725 mL of a 2.5 M solution? A tutorial on calculating the molarity or the concentration, of a solution. 1. If 1.25 moles of NaCl is dissolved in 250 mL of water, determine the molarity. 2. If 12.0 grams of calcium bromide is dissolved in 500 mL of water, determine its molarity. A tutorial on calculating the concentration of a solution in parts per million. 1. Jane dissolves 2.5 grams of cleanser in 1250 mL of water to clean a water jug. Determine the concentration of the resulting solution in ppm. 2. If 1.3 × 10-2 moles of Barium Nitrate is dissolved in 750 mL of water, what would the concentration be in ppm?